Do you ever want to just smash something? I’ve been releasing my aggression by smashing ice this winter. Unfortunately, my aggression is also caused by the same ICE! Due to the inclement weather, ice formations have been building up in my backyard and causing flooding inside my house. There is nothing quite like the shock of walking in iced water, that you didn’t see in your basement, in your socks. It makes me so ANGRY. After I change into dry socks and heavy boots, I grab my hatchet, my ice chipper and go outside and smash the ice. “TAKE THAT YOU EVIL ICE”, I scream. Unfortunately, my anger abates long before the amount of ice I have to smash to stop my house from more flooding is broken up and thrown deeper into the yard. Last week, I was out there for three hours. In the end, I was just cold and utterly exhausted. My anger had snuck off to find a much warmer place to fester. You may not have had the Ice Man Cometh to your house this winter, but there are many other things that can make one ANGRY. Might I suggest taking out your aggressions on a cucumber? As with the ice, there is a practical side to all this violence. 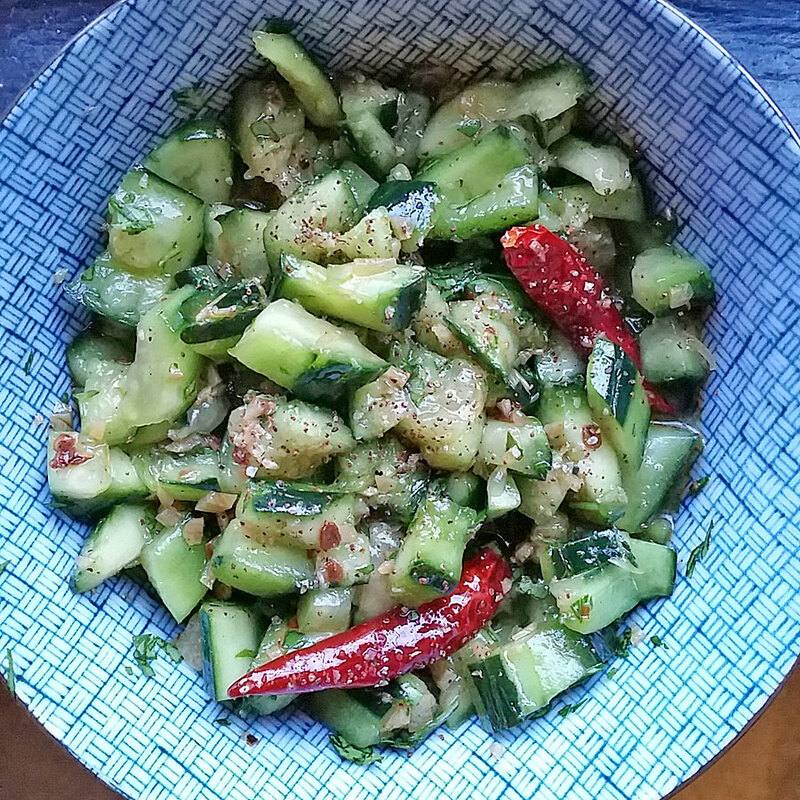 Smashing the cucumber in this dish breaks down the cell structure of the cucumbers so they can absorb more dressing. 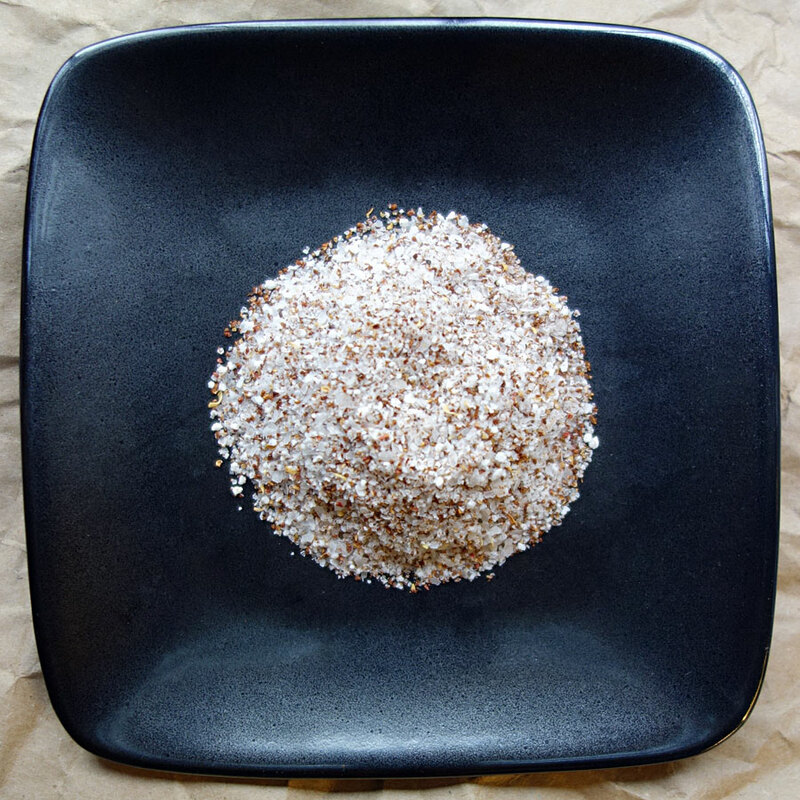 Combine dry roasted Sichuan peppercorns with salt to sprinkle an aromatic and mouth numbing flavor to any dish. In a dry small skillet, toast Sichuan peppercorns until they smell fragrant. Remove from heat. Cool. Combine cooled Sichuan peppercorns with salt in a grinder, mini food processor or mortar and pestle and process until they are finely ground. Sichuan Peppercorns are not related to black peppercorns. They dried berries of the prickly ash tree. They have citrusy flavor notes and a distinctive tingling and numbing effect on the tongue. Sprinkle this salt on popcorn, fries candied nuts, steaks, pork dishes, etc.